All right. Our next video is to take us from set up and weight shift and a little bit of the takeaway all the way to the top. You'll note that I didn't spend a lot of time or any time really discussing the positions of the club and all of that stuff during the takeaway. Again it's assumed that you've already worked on those takeaway drills in the five minutes perfect takeaway video. What we're going to do now is focus on getting you all the way to the top and give you some unique drills that you've probably never done before to help you understand how probably over dominant you are with your right side and how to start breaking that habit. The first thing we're going to do, we're going to use a club for this. You can take a club and flip it upside down. But you also can do this without a club, depending on how comfortable you are with the movements on the club on the swing plane. What we're going to do is revisit what we did last time. We're going to shift, pivot, turn on that right hip from a good setup position with axis tilt. Because that's what's going to keep you from slicing if you're setting up like this. This is what is getting you swinging over the top. You're going to feel like you're set up behind the ball with axis tilt. But with your left hand only, I want you to do the same takeaway drill that we did, the weight shift drill. Get all the way to the top. Heres what I want you to focus on. From down the line, this would be a lot more obvious. When everybody swings their left arm up, not everybody but for the most part most everybody, you never see this. You never see a really steep left arm, but it's something we see all the time with amateur golfers, swinging over the top. They get their arms really steep and then they have to cross it. When you're moving your body correctly, you're using your body rotation and weight shift to create momentum to help swing your arms to the top. Your arms can stay relatively relaxed. As you'll do this, notice that I'm using my ... Still using my little stomp drill. As I do that and I start to return it gets some momentum for my arms. Notice how shallow my arm is at the top of my swing. It doesn't really feel like work even with the club upside down to get my arm up in this position. It's uncomfortable, versus just letting it swing where it naturally wants to go. This is how you're going to start understanding how to create a natural swing plane without trying to manipulate it the whole time. But the main thing I want you to focus on here is now if I bring my right arm up, notice how shallow my arm is. Now we've talked a lot about the amount of elevation that you can have in your swing, and how it's a variable. But when you do this naturally, your right arm is going to tend to be very low and in front of your chest. This is a perfectly acceptable RST position at the top. So is this. But when we start seeing all this stuff and the elbow is way out here, we know that you're being very right arm dominant because your left arm just doesn't naturally want to swing up into that position. That's why I want you to focus on using your weight shift and hip turn and shoulder turn to swing your arms up into a natural position and then bring your right arm up there just to support it rather than kind of being the driver of the show. As you go back, your left arm and right arm are learning to play together nicely, instead of one overpowering the other. Because so many golfers tend to be too right arm dominant, we're going to do all of these drills left arm only using our weight shift and turn to swing the club up to the top, right arm comes up to support it. Left arm swings up, right arm comes up to support it. If you're checking yourself in the mirror, which I hope you are, you're going to see that my elbow is still in front of my torso. Not out here, and that the club, we'll do it again. Swing up to the top. The club face is going to basically match my forearms give or take a little bit here or there. Just don't want to see a really hooded. Don't want to see it really open. But my left wrist, nice and flat at the top. My arms are basically similar to being on plane with my shoulder, but probably just a slight bit above my shoulder plane. Again, it's a variable here. But from here, this is where we're trying to get. The trick to doing it? Letting your left armswing up there naturally. If you're one of those people when we work move to the downswing section that you tend to do this and swing over the top, you're going to find right away that you probably doing that with your right arm. What you're going to find when we go to the downswing stuff is the club's naturally going to shallow out and swing plane from the inside. Your goal with this exercise is 20 to 25 minutes if you can, 15 at the minimum. Try to give me 15. Turning back, letting your arms swing up to the top. Keep doing it. Just left arm only for the first 10 minutes. Feel what that feels like to get into a good position at the top. Load it up on this hip, and then start bringing your right arm up there to support it. That will get you into a great top swing position and start training this left side of your body to help move the club up to a good position at the top. 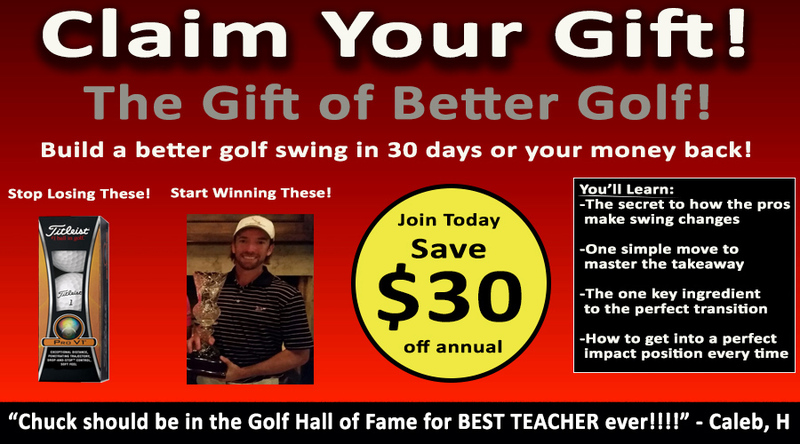 Get Your Free Membership to Finish Watching "Winter Golf Training Program - Backswing" Right Now!